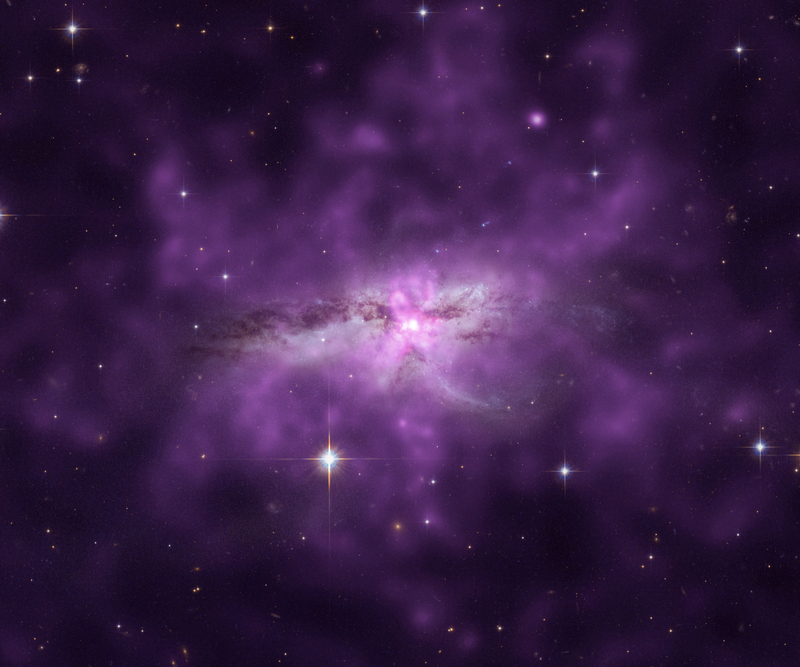 An enormous cloud of hot gas is surrounding two merging spiral galaxies. This gas reservoir contains the mass of 10 billion Suns, spans 300,000 light years, and radiates at more than 7 million degrees. 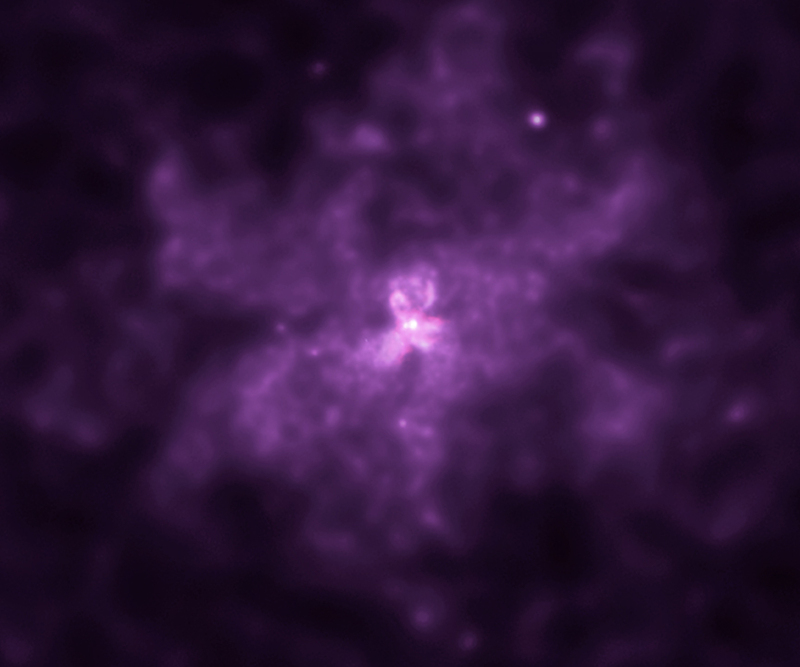 X-rays from Chandra (purple) have been combined with optical data from Hubble to make this composite image. A burst of star formation that lasted for at least 200 million years may be responsible for this extra large cloud of hot gas. This giant gas cloud, which scientists call a "halo," is located in the system called NGC 6240. Astronomers have long known that NGC 6240 is the site of the merger of two large spiral galaxies similar in size to our own Milky Way. Each galaxy contains a supermassive black hole at its center. The black holes are spiraling toward one another, and may eventually merge to form a larger black hole. During the extended baby boom, shorter bursts of star formation have occurred. For example, the most recent burst of star formation lasted for about five million years and occurred about 20 million years ago in Earth's timeframe. However, the authors do not think that the hot gas was produced just by this shorter burst. What does the future hold for observations of NGC 6240? Most likely the two spiral galaxies will form one young elliptical galaxy galaxy over the course of millions of years. It is unclear, however, how much of the hot gas can be retained by this newly formed galaxy, rather than lost to surrounding space. Regardless, the collision offers the opportunity to witness a relatively nearby version of an event that was common in the early Universe when galaxies were much closer together and merged more often. Coordinates (J2000) RA 16h 52m 59s | Dec 02° 24´ 01.70"
This is awesome that you'll keep those of us who actually care about this stuff, up to date. Thank you for being informative. Thank you for sharing education. it is amazingly beautiful, it shows how small we are! I hope there will be more projects like Chandra to help us understand and appreciate our elegant universe! A large reservoir of gas contains as much mass as 10 billion Suns, spans about 300,000 light years, and radiates at a temperature of more than 7 million degrees. About 330 million light years from Earth. About 290,000 light years across. In the constellation Ophiuchus, visible in both Hemispheres.